The Crater Notch Trail has been trashed by logging and not repaired! Click here for more photos and a concise alert because YOUR EMAILS ARE NEEDED NOW to get the trail repaired and insure bare-ground logging is not allowed! DNRC issued its decision to indeed log along the lower reaches of the Broken Leg and Crater Notch trails, adding a decision (page 11) and responses to public comments at the end of its Environmental Assessment. 1. Huge, heavy feller-buncher machines will not be used to cut the “diseased” trees. They will be hand-felled using chain saws, greatly reducing machine traffic on the ground. 2. Skidding of the logs will be done using cable-winch skidders, rather than grapple/tong skidders - and it will be done on frozen ground and snow. The greater “reach” of the cables will greatly reduce the soil area traveled on by the skidders and frozen ground will lessen damage to the soil and trails. 3. DNRC will mark the trees to be cut, rather than leaving the choice up to Stoltze Lumber. 4. Public comments from 50 people let DNRC know there are lots of eyes on this project and should help insure a more careful job is done. We took lots of “before” photos of the trails and we will take “during” and “after” photos as well in order to document whether DNRC and Stoltze followed through on the promises made. Big thanks to all of you that wrote in on this. The results will be better for it! THE GOOD NEWS: Fifty folks like you told DNRC to protect the Broken Leg and Crater Notch Trails, including the nearby aesthetics and wildlife habitat - and DNRC has halved the acreage it proposes to let Stoltze Lumber Company log there. THE BAD NEWS: Rather than likewise reduce the “salvage” logging volume from the initial proposal of 55 truck loads, DNRC has proposed to now log some green trees along with the dead and dying trees in order to “sanitize” the forest (by removing up to 50% of the trees)! DNRC has posted a brief Environmental Assessment and has invited public comment again until December 19, 2014. Urge DNRC to select the “No Action” alternative in the EA, which would simply leave the area alone and natural. Click here to read SVC’s comments to DNRC on its EA. Many thanks to those of you that are writing in on this! (From October 5, 2014, below). While logging its neighboring land near the Jewel Basin Road this fall and winter, Stoltze wants to take feller-bunchers and grapple skidders onto Montana Department of Natural Resources and Conservation land to “salvage” 55 log truck loads of reportedly dead and dying trees. DNRC says this beautiful, healthy forest may be reduced to as little as 8-10 trees per acre! 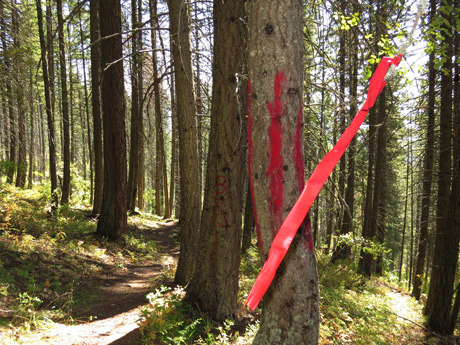 DNRC in 2006 agreed to protect the recreational and aesthetic values of these trails by moving its Foothills Timber Sale downhill and out of sight of them. Click here to read that letter of agreement! 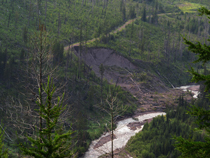 The Forest Service’s Broken Leg and Crater Notch Trails lie on DNRC easements in the exact area Stoltze wants to log and are highly valued, non-motorized recreation trails leading to Jewel Basin and the historic Alpine Trail #7. This is simply the wrong choice of an area to be logged! 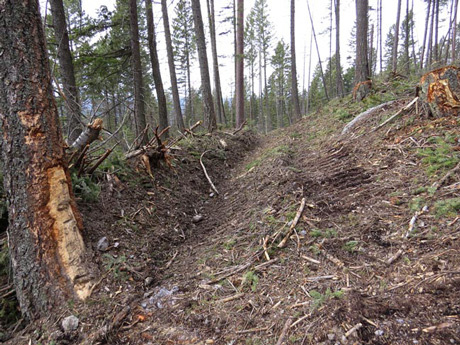 The Broken Leg Trail has already been turned into a logging road where it crosses Stoltze Land. Let’s convince DNRC to again respect the value of these trails where they cross State Land and not allow logging there! Click here for a map of the proposed logging. Comments are due by October 20th! Click here for our recent letter to the editor for more information. Click here and scroll down to “Scoping Notices - Birch Creek” for DNRC’s invite of public comment. UPDATE: Click here for SVC’s letter to DNRC in this matter.